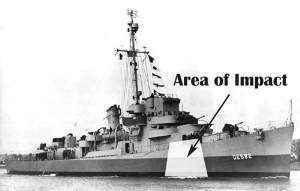 In her short lifetime in the service of the United States Navy, in all her missions and assignments of convoy duty on both the Atlantic and Pacific Oceans, the Underhill did not lose a single ship to enemy action. Something of which her crew members, past and present, should be justifiably proud. We think Ensign Samuel Jackson Underhill would be proud of his namesake. This section focuses on the sinking of the USS Underhill and the aftermath of what happened to the crew and the people it affected. Select each of the gray tabs below “July 24th 1945” on the left for detail.